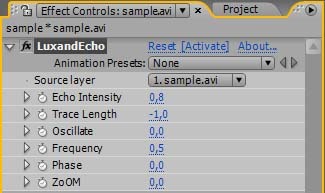 Wave FX makes adding realistic waves to your video a matter of just a few mouse clicks. Just launch Adobe After Effects, load your video, and process it with the Wave FX plugin to make a stunning underwater video clip! With Wave FX, you can make your video clips appear to be shot underwater, or recorded with a camera immersed into other liquids with a variety of settings. For example, choosing a higher viscosity and more inertia for your waves will simulate oil immersion, which will look even more realistic when you adjust the transparency setting. Normal viscosity will produce waves on the water, and lower viscosity and inertia settings will simulate the appearance of waves on lighter liquids such as spirit or gasoline. There are seven parameters to configure, including Path, Frequency, Disturbance, Surface Tension, Inertia, Viscosity, and Transparency. Higher tension, inertia and viscosity will correspond to denser liquids such as oil, while lower settings will create waves on a lighter liquid such as water, gasoline, or spirit. The free Luxand Wave FX plugin will not cost you a dime. Download it now and give it a go!